Whizz the basil, oil and vinegar in a small food processor; season and set aside. Halve the melon, scoop out the seeds and discard; slice into wedges then cut away the skin. Peel the cucumber, halve lengthways, scoop out the seeds with a teaspoon and discard, then cut into chunky pieces. 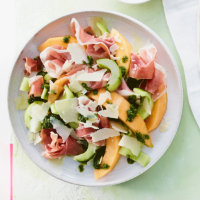 Layer up the salad with the ham and cheese on a serving plate, splashing the vinaigrette in between. This recipe was first published in Thu Jun 28 17:14:17 BST 2018.